Good morning! It's time to recover from the first round of holiday gatherings:) I am starting to see my kitchen again! Unfortunately, my son is sick today. I'm hoping he gets better really quick! 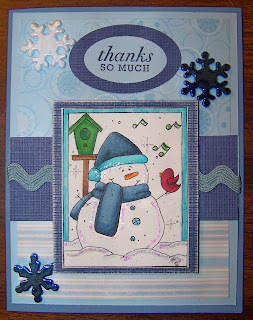 I made this card for a Christmas thank you - I love this little snowman from the Stamping Boutique! I am entering this in Cupcake Craft Challenges - thank you cards. 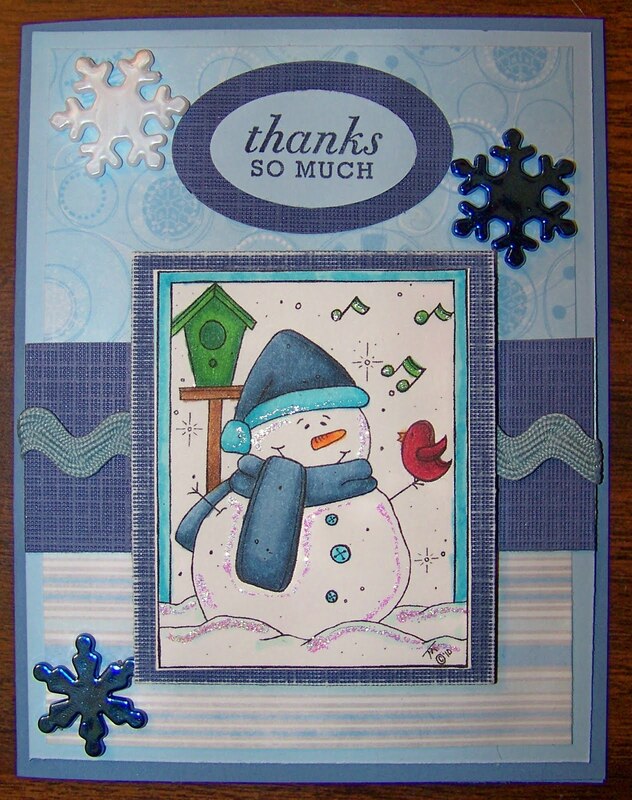 Supplies are image by Stamping Boutique colored in with Copics and highlighted with Crystal Stickles. Paper is DCWV and SU Brocade Blue and Bliss Blue. Sentiment is from Papertrey, snowflakes are from Wal-Mart. awww, this is super sweet Colleen! love this snowman image!!! Love it Colleen! The snow is so cute and I love all the blue! This is so cute, love the image! This is sooo cute...love that image! Aww.. I love snowmen and he's just so jolly looking! I love how you use so many layers.. and your layers aren't always paper.. that ric rac across the middle is awesome!